A BLOODY VENDETTA HAS BEGUN. Detective Dan Bradley becomes the victim of a devastating attack. Bradley and his partner Eva Roberts are left to pick up the pieces. But they soon learn of other victims. The private detectives must track down a villain unlike any they have ever known. Relentless and bitterly cruel, he strikes people from Dan Bradley’s past. Each victim is connected to the boxing club where Bradley boxed in his youth, but the targets have little else in common. Bradley hunts for suspects and potential new victims, but without an obvious motive, progress proves almost impossible. Yet plenty of people are depending on him. Bradley is determined to stop the villain before the senseless attacks turn into murders. But Dan is weak and needs time to heal - time he can ill afford. But the trip turns out to be anything but a break. Their nightmare tracks them down. The vendetta is taken to the next level. Some victims are in denial - too scared to face the truth. Perfect for fans of Ian Rankin, Helen Durrant, Janice Frost, Joy Ellis and LJ Ross. If you love to read gripping thrillers with flawed characters, a touch of humour and a hint of romance, you’ll love Harder They Fall. 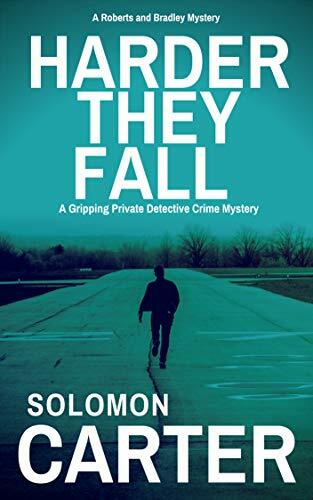 If you enjoy page-turning crime mystery novels, noir crime thrillers, heist crime thrillers, British crime thrillers and detective series with strong female characters - then Harder They Fall is for you.